Aussie based start-up, HempOz, is taking drinks to the next level and giving everyday Aussies the chance to consume hemp…legally. Bursting with flavours from the Australian Outback, Hemp Oz have created two innovative and original products and at its core, is helping consumers Quit Sugar in its hemp infused product ranges: hemp kombucha and hemp water, that are giving Aussie drinkers an alternative and healthy choice in the ever-growing beverage market. HempOz infused water with ginger and lemon, offers drinkers a unique twist on your everyday H2O. Lightly sparkled and naturally unsweetened, its zesty flavour makes it a perfect drink to stay hydrated and moisturise the inside and energised throughout the day. Creator John Leith states that “Our purpose is to provide the best organic, natural products to health-conscious consumers. They’re perfect to enjoy at all scenarios and seasons and are quite refreshing to have after a long, hard day”. “Our purpose is to provide the best organic, natural products to health-conscious consumers”, states creator John Leigh. “They’re perfect to enjoy in all occasions and seasons and are a good alternative to help you quit sugar. 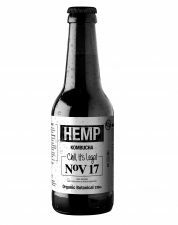 HempOz has also been a key supporter in the legalisation of medicinal and consumable hemp related products in the Oceanic region. Recently, they have partnered with the United In Compassion (UIC) charity group, in the hope to encourage further dialogue and education on the practical benefits and scientific research on the utilization of medicinal cannabis. The company have also provided a platform for its 250 000-member strong network, Medicann, which has improved community efforts in patient accessibility towards medicinal and health related products.